This suite is chalkboard meets the Hawaiian islands! The chalkboard effect was created digitally and printed on pure white cardstock. It includes aqua and pool elements, inspired by the gorgeous ocean surrounding Hawaii. This suite includes a A7 invitation on pure white paper,, 4bar RSVP card with matching pool envelope, all enclosed in a shimmery silver envelope. 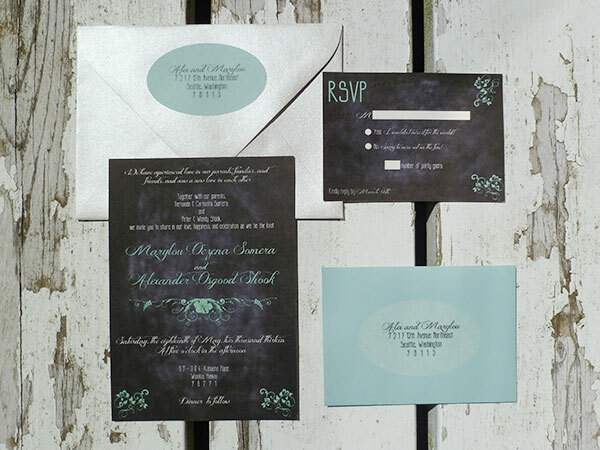 The RSVP card is addressed using vellum printed labels, and the invitation envelope with pool blue labels.